Everybody loves a holiday bargain! And with quality-assured accommodation in Corsica , Gites Corsica is the perfect place to find special offers on holidays in Corsica . Apartments for city breaks, gites for family holidays, charming bed and breakfasts for couples, countryside campsites, stopover gites for groups, and a host of themed holidays, from sports to pet-friendly to jam-making stays… Gites Corsica is where you’ll find all these and much more! Our promotions and deals on holidays in Corsica include special low-season rates, discounted prices for longer stays and late-booking offers. To ensure your satisfaction, all the accommodation in Corsica offered by Gites Corsica has been quality-checked and given a grading of between 1 and 5 “épis” (ears of corn), depending on the degree of comfort offered and the facilities available. These standards are set nationally and are maintained by means of regular inspections of all our accommodation in Corsica . 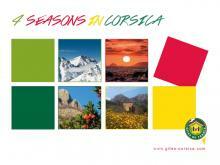 Of course, there’s more to creating great holidays in Corsica than simply providing quality accommodation. At Gites Corsica, we place great importance on ensuring that, whatever type of accommodation you choose, you receive the warmest of welcomes. We also help you choose the holidays in Corsica that are right for you by providing detailed information about the different regions of Corsica, places to visit and things to do in Corsica, and even how to get to Corsica by train, boat or plane. All you need to do to start planning your holidays in Corsica is browse the many special offers below, choose your preferred accommodation in Corsica and then use our secure online system to make your booking.